Craig Buescher, University of Nebraska Foundation development representative, tours the NCTA Welding Laboratory with instructor Dan Stehlik. CURTIS, Neb. — Before his death in 2000 at the age of 91, Mervin R. Eighmy established a foundation which pledged steadfast support to Nebraska agriculture, youth and education. Today, that philanthropic plan laid out by Eighmy, a Custer County ranch owner, animal scientist and president of Gooch Feed Mill, is as strong as the steel welds forged by students at a rural Nebraska college. 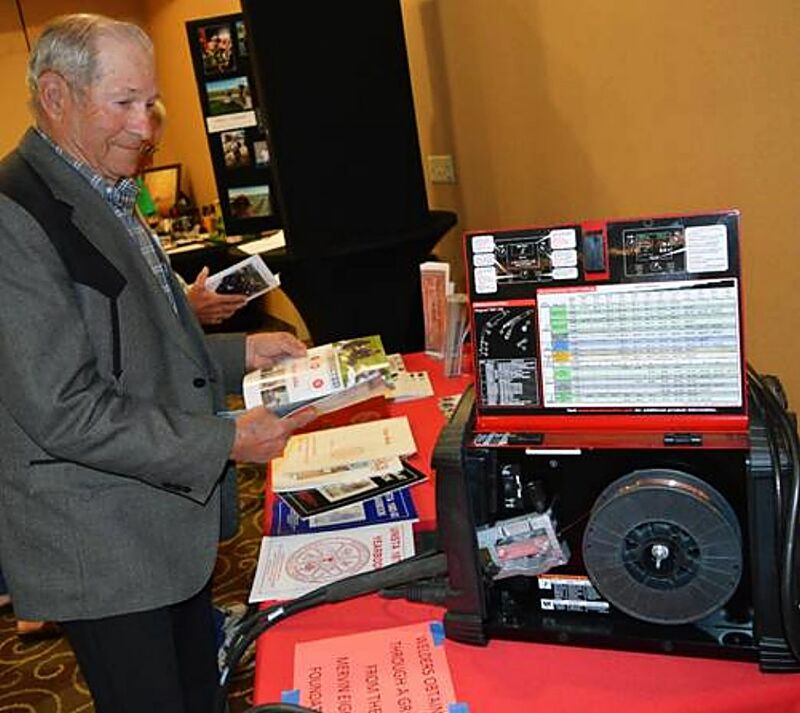 The Mervin R. Eighmy Foundation, launched in southern Custer County by Eighmy and continued by a dedicated board of directors who meet several times a year, has provided a $16,000 gift to the NCTA Lab Equipment Fund at the University of Nebraska Foundation. 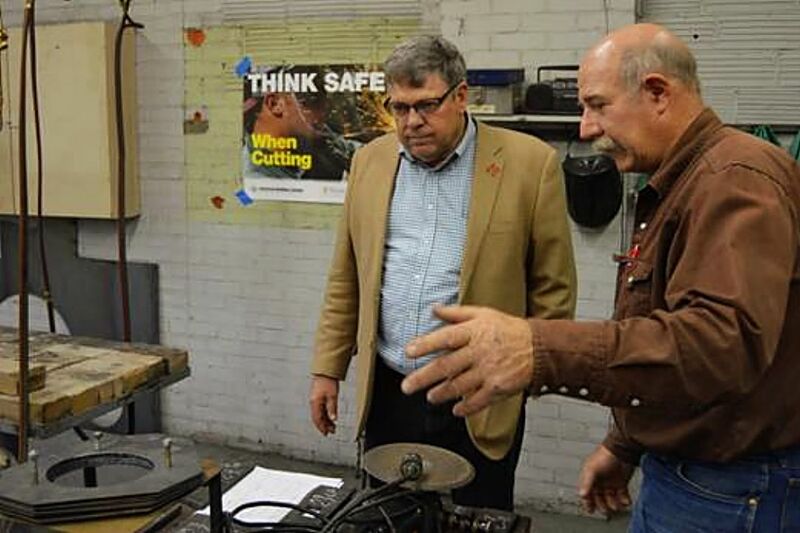 That gift allowed the Nebraska College of Technical Agriculture in Curtis to add eight new welders, supplies and technical support for the expanded welding program at the two-year college. "This support by the Eighmy Foundation allowed state-of-the-art equipment to be installed and used by students studying technical trades and agricultural education," said NCTA Dean Ron Rosati. Fittingly, in June, the UNSTA/NCTA Aggie Alumni Association gave its 2017 Alumni Service Award to the Mervin R. Eighmy Foundation during an alumni banquet in Broken Bow. Former State Sen. Jim Jones of Eddyville accepted the award on behalf of the Eighmy Foundation and fellow board member, Jim Stewart of Lincoln. Jones ranches in southern Custer County, managed an Eighmy ranch and partnered in cattle and agribusiness endeavors with Mervin Eighmy, who did not marry and had no children. "Youth and education were two very important things to Mervin Eighmy," Jones said. "The Eighmy Foundation has invested in many youths in Nebraska, at high schools and colleges, and in scholarships and youth programs around Custer County, in particular." The addition of eight new welders at NCTA is a strong commitment to the college and rural youth, notes Jim Stewart, Eighmy Foundation board member, Lincoln accountant and Aggie graduate. Jim Stewart and his brother Mike Stewart, now deceased, both graduated from the University of Nebraska School of Technical Agriculture where they earned associate degrees in production agriculture. Stewart's classmate, friend and fellow alumnus, Dan Stehlik, originally from Dorchester, Neb., taught agricultural education for 19 years in Kansas high schools. Stehlik is now in his third year as NCTA's agricultural mechanics instructor which includes welding, electricity, irrigation technology, farm machinery maintenance and small engines courses. To facilitate the expansion of the college's welding program in 2016, NCTA Dean Ron Rosati endorsed Stehlik's proposal to upgrade equipment, facilities and the overall program. Enter Jim Stewart and the Eighmy Foundation whose philanthropic efforts continue throughout Nebraska. "Jim saw the need in updating the welding program, and with the help of Dan Stehlik, Dr. Rosati and Craig Buescher at the University of Nebraska Foundation, this gift from the Eighmy Foundation will be a great asset to NCTA," said Kim Mortensen, '83 UNSTA Vet Tech graduate, and Curtis area farmer and cattle feeder who just completed a two-year term as Aggie Alumni Association president. Stehlik was given the nod to order four Lincoln brand and four Miller brand multi-process welders which are capable of short circuit wire, arc and TIG welding. They are also equipped with spool gun attachments which enable aluminum and stainless steel welding. "Although limited to about ¼-inch material thickness metal, we now have the capability in our laboratory to train with multiple processes and materials and engage all eight welding stations at a time," Stehlik said. The project supplements hands-on training in oxygen/acetylene processes; cutting, brazing, and fusion welding — with and without filler rod. One larger welder is capable of spray and globular welding processes that are used throughout the agriculture industry. "Future plans are to expand this agricultural industry capability and possibly develop some robotic welding applications for the students to apply as well," Stehlik said. The NCTA program expansion has also included skills training and testing so that interested students might become certified steel welders by the American Welding Society. Certification is a professional industry standard. The college's first NCTA Welding Certificate student, Roman Netherton, also became AWS certified prior to his graduation in May. He started work in June as a welder with a business in Cozad, his hometown. Mervin Eighmy, and now his charitable foundation, have been longtime benefactors of the University of Nebraska and its students, including support for the Mervin Eighmy Agricultural Scholarship, the Eighmy Farm Management Fund and more. Additional information about NCTA programs is available at ncta.unl.edu or at 1-800-3CURTIS.